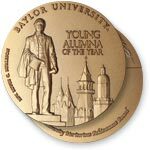 Awarded annually to a graduate age 40 or under who has demonstrated remarkable achievement in the previous year. He is one of the youngest university presidents serving today and he traces the roots of that call to Baylor University. In August of this year, Michael, was named the eighth president of Gordon College, near Boston. Michael was deeply shaped both as a scholar and a leader during his time on campus and names professor Tom Hanks' course on Chaucer as a defining moment. He views the opportunity to lead Gordon as a way to shape future leaders and address important issues at the intersection of faith and culture. Michael is the Pulitzer-nominated author of Faith in the Halls of Power, an honored sociologist, and a noted scholar at the James A. Baker III Institute for Public Policy at Rice. But he counts winning the heart of wife Rebecca, also a Baylor alum, as his greatest accomplishment. Michael, we congratulate you on your appointment as president and share your enthusiasm for the impact of Christian education on tomorrow's leaders. Read more about Michael Lindsay in Baylor Magazine.